When you create an Order for a customer, on the Edit Order screen, the system automatically checks the Enable Auto pay check box. (Fig 1.a Enable auto pay checked). If this box is checked, and if the customer has a valid credit card or ACH information on file, then payments for all invoices generated from this order will be processed automatically on the invoice due date. (Fig 1.b). Uncheck the "Enable auto pay" setting if you do not want the system to automatically process payments (during nightly batch processing) for any invoices generated from this order. 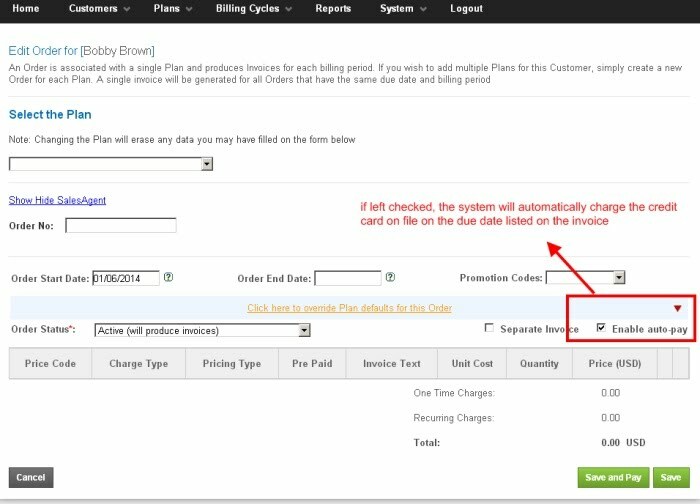 A customer can have multiple orders that result in a single invoice (default behavior if the orders all have the same billing period, due dates and if the "separate invoice" checkbox is not checked). 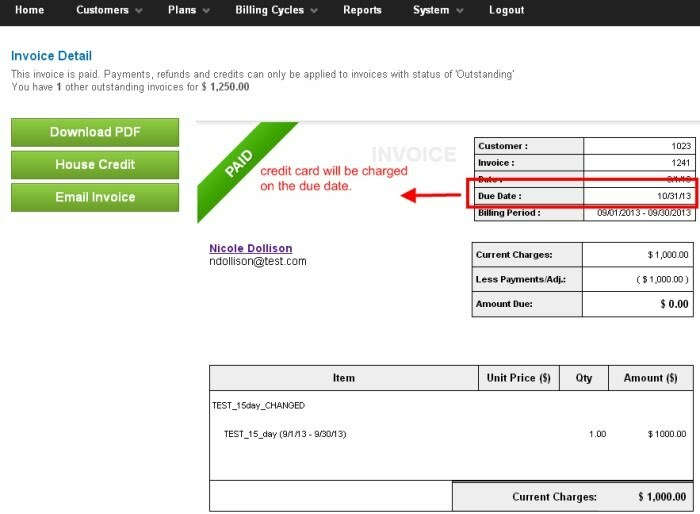 If autopay is disabled for any order, then none of the charges on the same invoice will be processed. The payment method used for the auto-pay is controlled by the sequence under which the payment methods appear under the "Payment Options" tab on the Customer Account Summary page. If no payment information (credit card or ACH) is saved on file for the Customer that this Order belongs to, then the "Enable Autopay" at the Order level is moot. Fig 1.b Payment processed automatically on due date.